Europe faces yet another recession, and the prospect is shaking global financial markets. To eliminate the persistent threat of collapse, Europe must drop the euro, and Germany must abandon mercantilism. When the euro was adopted in 1999, domestic prices, the face values for bonds and loans, and bank accounts were translated into euros according to prevailing exchange rates for national currencies at the time. Initially, the single currency posed few significant problems. Over time, however, differences in labor market policies and geographic conditions that are difficult for governments to alter caused productivity to grow more rapidly in Germany and other northern economies. Also, Germany and northern states pursued mercantilist, exported-driven growth strategies. Prices for many goods made in Italy and other southern economies became too high to be competitive in the north. Those countries imported more than they exported and financed the resulting trade deficits by borrowing from the north. In Spain, a property boom permitted homeowners to run up large mortgages, and banks borrowed heavily from the north to finance those. In Italy and Greece, governments spent and borrowed heavily through bond financing to prop up employment. In the wake of the global financial crisis, private borrowers and governments could not pay their debts. To obtain financial assistance from the IMF, European Central Bank and northern European governments, Mediterranean governments implemented severe austerity. Budgets were slashed, and unemployment rocketed but fundamental problems went unaddressed. Wages and prices remain too high in the south, and German Chancellor Merkel clings to mercantilism. Europe never fully recovered from the Great Recession. Unemployment exceeds 12 percent in Italy and Portugal and is about 25 percent in Spain and Greece. Deprived of markets for exports in the south, industrial production in Germany fell this summer, and across Europe inflation is nearly zero. The European Central Bank, unlike the U.S. Federal Reserve, is prohibited by its charter from purchasing trillions of euros of bank and government securities to prop up growth, but in any case, that would be only a temporary fix. With mortgages and businesses loans denominated in euros, it is tough for prices to fall the 25 percent needed in southern economies to make exports competitive in the north. If workers and businesses took wage and price cuts that large, they would default on loans underwritten by creditors in the north. However, if southern countries again had their own currencies, their exchange rates against the German and other northern-country currencies could fall enough to make their exports competitive in the north. For the perpetual economic crisis in Europe to end, two things are necessary. 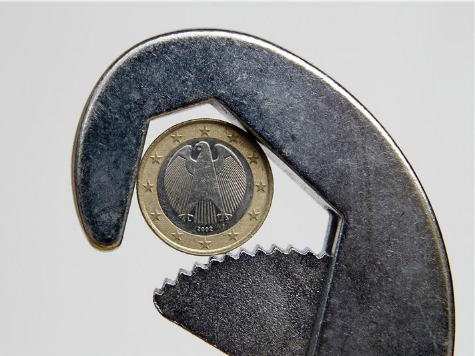 Europeans must recognize that the euro is a straightjacket that impedes price adjustments to compensate for differences in productivity among countries and permit markets to function effectively. The euro is not necessary–the European Union enjoyed prosperity, not unending recession, before the euro. Germany and other northern states must recognize to have adequate markets for their exports they must import too, or their southern customers must borrow ever larger sums–something financial markets cannot accommodate. Northern governments must readjust their economies to balanced trade with the south, and substantially increase domestic consumption, likely through increased government spending. Germany, having the largest economy and being the most significant creditor state, must recognize these realities but Merkel, like a medieval doctor bleeding a patient, clings to the false notion that austerity and double digit unemployment will cure southern Europe–it simply won’t. Italy and other southern states must abandon their antiquated labor market policies and profligate government spending. Germany must reform too, and the euro must go.